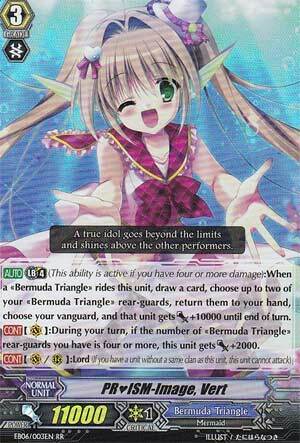 [AUTO] Limit Break 4 (This ability is active if you have four or more damage):When a «Bermuda Triangle» rides this unit, draw a card, choose up to two of your «Bermuda Triangle» rear-guards, return them to your hand, choose your vanguard, and that unit gets [Power]+10000 until end of turn. ...this one is out here simply because of how it, for the US, paved the way for Break Rides as it's the first one to it our soil. I had a rough time deciding between going with Vert or honorably mentioned PR♥ISM-Promise, Labrador as her Limit Break is a game-ender in itself, but I chose Vert from the amount of flexibility that she has and the amount of combos you can make with her. Need more power? Break Ride and bounce a Clear/Celtic to give an extra point boost. Need more cards in hand? Break Ride and bounce Rio to fill the Soul, draw cards and bounce cards to have more guard. Need to rearrange your columns? Break Ride and fix them up! I will admit that her Break Ride nowadays isn't as potent as others, but the fact that you are able to do so much with Vert and the Bermuda Triangles in general is why I had to put her on my list.